As someone who is an enormous fan of wearing really fun fashion things without looking nuts and being supremely comfortable at all times, it makes sense that I'm a massive sneaker enthusiast. Not in the same way my boyfriend is (our Instagram feeds deviate accordingly), but in a "rather than heels, I keep white sneakers under my desk that never go outside and therefore remain perfectly clean" kind of way. Should you catch me kind of squinting as I watch crazy looks coming down the runway during fashion month, that's just me playing my favorite game of mentally swapping out designer footwear for a much more humble pair of kicks. One could argue that this is basically street style in a nutshell… IMO, it makes every outfit real life–ready (and thus infinitely better). 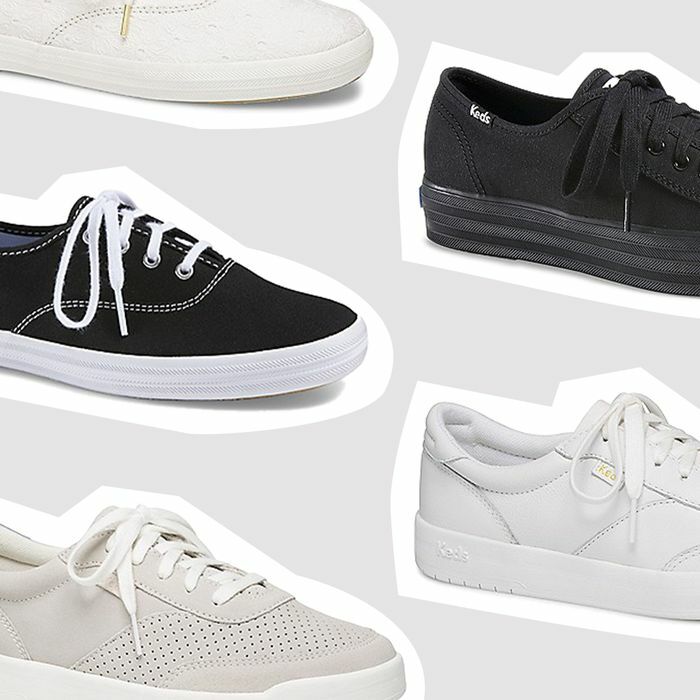 And so here we are again: Time for our seasonal sneaker outfit update! These five (admittedly quite full-on) outfits cover off spring's best (albeit slightly controversial) trends, all of which I think are fantastic and all of which I've made a little more wearable with the help of my personal favorite Keds sneakers. Get into it. Bike shorts are a whole big thing, and they're popping up everywhere, from the runway collections on NET-A-PORTER to Mango's latest campaign. As someone whose dad really enjoyed both cycling and all associated cycling apparel, I kind of find myself being into them completely against my will. Style 'em up for a look that feels like you're Princess Diana heading upstate for the weekend circa 1992, with a super-structured blazer and pops of gold details, from the zippers of a croc-effect bag to the hardware on your sneakers. There's something really going on with outfits that make you feel like you're a cool girl going to an '80s Oscar after-party. I personally prefer a major dress as part of a look that says "I paid a fortune for this frock, and it will not simply hang in my closet during daylight hours." Get brunch-ready by rocking cool sunglasses and black sneakers styled up with sheer socks (or even a little athletic number would feel pretty excellent juxtaposed with the luxe fabric). And this whole pearl hair-clip trend, seriously… They're everywhere, and I don't hate them. Tie-dye is probably the spring trend that's the most polarizing in our office—I am personally filled with warm memories of making my own tie-dye tee at summer camp many moons ago, using essentially the exact same color palette as seen here in this tempting little Ellery number. I’m just saying. Anyway, I really love a tonal outfit, and the different textures of the sequined pants and the linen blazer are really working for me here. A super-bright-white pair of leather sneakers is essential, plus an even brighter tote so it feels modern versus pretty. The transparent PVC takes the edge off a little, helping the pop of color make sense against a soft palette. As someone who has never considered myself (nor has anyone else run the risk of mistaking me for) a streetwear-hypebae–cool kid, I find myself increasingly surprised that I might be a bucket hat enthusiast. Also, slime green (and neon in general) has become this essential layering moment that weirdly really works with everything it clashes with. Classic Champion Originals (black with white stitching, obviously) add to the vibe, while a structured bag makes it feel more grown-up and intentional. I suspect all that's left for me to do is to apologize to my fellow editor, Nayiri: She has hated bucket hats from day one and will no doubt hate this outfit too. Clashing these colors and prints (and more print) and a metallic oversized shirt and this belted retro-inspired skirt and those big Versace medallion earrings… It's a lot, but add sneakers and it's also kind of like you're just this really fabulous, chill Italian blogger who is going to sit and drink an Aperol spritz and eat melon and prosciutto for most of the afternoon, and then maybe go and jump on a yacht. Or maybe you're going to Trader Joe's, I don't know. But getting a handle on the "Italian weekender" vibe is key to my whole spring aesthetic, which means Vespa-ready footwear (and at least one item in a Fendi-esque print).